It’s now just over 8 months since Edward Snowden was granted political asylum in Russia after being stranded there when US authorities revoked his passport. Snowden has been in and out of the press since then – from being awarded the Sam Adams prize for integrity in intelligence to “delivering testimony to a European Parliament inquiry” into surveillance – but it was his actions on Thursday that stepped over the line as far as “many” in the Western press were concerned. The Edward Snowden leaks were not wholly contemptible. Unlike, it’s now thoroughly clear, Edward Snowden himself. 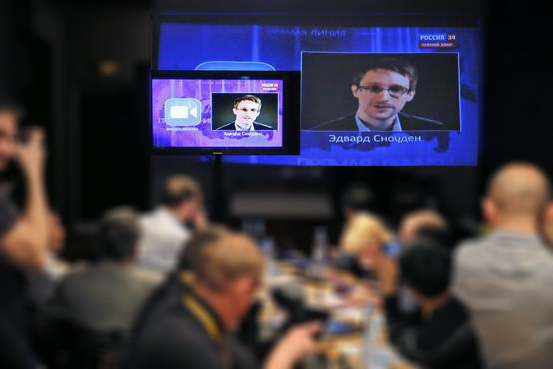 Snowden went on to challenge Putin’s “evasive response” citing comments made by Andrei Soldatov (an authoritative source on Russia’s security services according to the New York Times) suggesting the public challenge “could lift a de facto ban on public conversations about state eavesdropping”. Yet when Snowden, someone with a precarious citizenship status, challenges the president of country which has temporarily granted him asylum publicly – first on an admittedly canned television programme, and then in a foreign newspaper (which, it so happens, was recently awarded one of the coveted US journalism prizes, the Pulitzer) – he is reflexively mocked by numerous professional journalists as little more than a ‘pawn’ in a ‘propaganda show’. Editor-in-chief at Think Progress Judd Legum, wrote, “[t]he problem with Snowden’s response is that you can’t actually ask a question at a propaganda event”. Fox News’ Howard Kurtz, surmised, “[i]n a few moments, Snowden became part of a Soviet-style propaganda machine”. Washington Post and Slate columnist Anne Applebaum responded, “maybe he thought he was clever, but no one watching got the joke”. Julian Hatten, of The Hill, asked rhetorically, “[i]s Snowden Putin’s puppet?”. Dylan Byers Politico blog writer Hadas Gold referred to the appearance as “a move that many described as a clear propaganda effort by the Russians, with Snowden as their pawn”. Where ‘many’ is apparently used as shorthand for ‘my ideological contemporaries’. Foreign Policy columnist Michael Weiss commented, “So now Snowden is asking pre-scripted questions of Putin, who welcomes him as a fellow spy”. New York Magazine’s Joe Coscarelli’s headline read, “Russia Deploys Edward Snowden Cameo at Vladimir Putin Propaganda Show”, while below Coscarelli argued that “Snowden served up a chance for Putin to tell the world that Russia doesn’t spy on its citizens like the big bad U.S. does”. A dangerous argument for the journalism profession, should it take hold, positioning all (alleged) soft ball questions by journalists as tantamount to complicity. And what is much of what is referred to as journalism, other than the asking of questions, to which we can safely predict the answers, of powerful people? If there’s a problem with scripted questions and compliant journalism, the Washington press need look no further than the Washington press, where President Obama doesn’t even need to preapprove press conferences to feel safe in the knowledge he won’t be caught off guard. The question related to the (at that time) alleged use of chemical weapons by a yet to be identified party in the Syrian conflict, and was prompted by comments made by the US president in August the previous year. Obama had, “to the surprise of some of the advisers”, put in place a so called ‘red line’, past which the US could be expected to intervene in the conflict. The White House had specifically warned the Assad regime that the movement or use of chemical weapons would not be countenanced. And those officials responsible for any use would be “held accountable for their actions”. This statement would from then on shape international coverage of the Syrian conflict, in many ways rubber stamping the criteria for intervention, without the need for a firm basis in international law. Another fascinating example was provided by the BBC’s Washington correspondent and the presenter of BBC World News America, Matt Frei. In a video piece reporting on the killing of Osama bin Laden. Frei, backed by a soothing piano soundtrack, asked viewers to admire Obama’s chin. Upon which evidence could be found, Frei claimed, of a “warrior president”. And if you are still looking for further examples of a docile press, the BBC has a whole back catalogue of examples. To be fair to Sopel, he did ask a few critical questions eventually, though none of them made it into the final edit or the accompanying report. When former foreign editor of BBC News journalist Jon Williams, now with ABC News, addressed criticisms of impartiality against BBC reporting in it’s description of the North Korean regime and it’s leader, he didn’t even go to the trouble of looking through the BBC archive. The answer of course was pretty straightforward. At the BBC, when Williams was editor there, totalitarian or dictatorial rulers could be found referred to as “Crown Prince” or simply the “King”, if they are of Saudi origin anyway. In the last few days we’ve also seen the fascinating spectacle of serious news organisations (unlike, say Buzzfeed, who wear’s it’s traffic-journalism on it’s sleeve) excitement at the ‘news’ Hillary Clinton’s daughter is pregnant. Evidencing enthusiasm for embryonic gestation second only to that of the UK press’s fawning over Kate Middleton. Politico, the BBC, Mashable, to name but a few, all have begun what will no doubt become a series of stories on the subject. As an MSNBC panelist forewarned, “an entire nation is going to watch a family have a child”. But I’ll leave you with a piece of journalism from CNN’s military sounding ‘political unit’ that has to be seen to be believed.